British Prime Minister Theresa May told leaders yesterday (20 September) that her country will not turn away from the world after the shock vote to leave the European Union, seeking to allay fears over the future unity of the West. 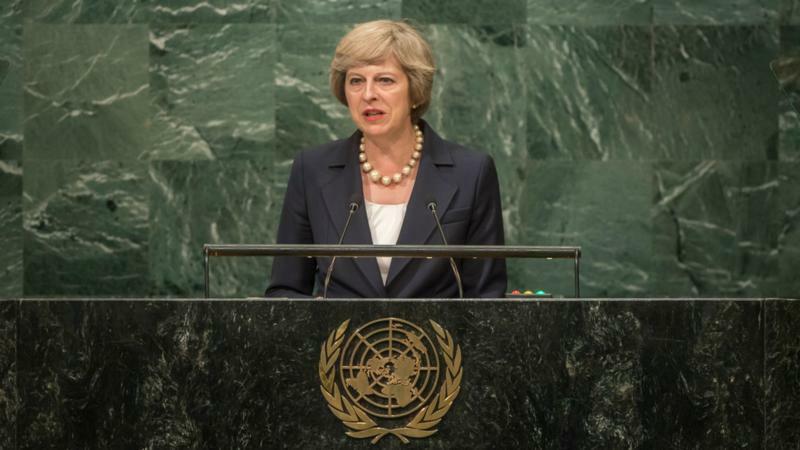 In her maiden speech to the United Nations General Assembly, May sketched her views on how to deal with terrorism, mass migration and modern slavery while also calling for modernisation of the 71-year-old organisation. “When the British people voted to leave the EU, they did not vote to turn inwards or walk away from any of our partners in the world,” May told the General Assembly. The 23 June vote took many investors and chief executives by surprise, triggering the deepest political and financial turmoil in Britain since World War Two and the biggest ever one-day fall in sterling against the dollar.Britain’s allies fear that its exit from the EU could mark a turning point in post-Cold War international affairs that will weaken the West in relation to China and Russia, undermine efforts towards European integration and hurt global free trade. Britain retains its role in the NATO military alliance as the EU’s biggest defence spender, its permanent veto-wielding seat on the UN Security Council and four submarines armed with nuclear ballistic missiles. But some diplomats and CEOs are worried that Brexit could torpedo Britain’s economic interests and clout, a suggestion that riles British ministers. US, Japanese and European banks have raised concern about the impact on London, currently the only global financial centre to rival New York, while investors say the shape and timing of Brexit remain unclear. May has said she will not trigger the formal EU divorce this year and will get a good deal for Britain, though elections next year in France and Germany could complicate negotiations on an exit deal. While recent economic data suggests the economic impact of Britain’s vote to leave the EU has not been as severe as some predicted, the hit to the world’s fifth-largest economy is also unclear and there are some signs of a slowdown in investment. May, who says she will implement Brexit even though she argued against it before the vote, met Wall Street bankers and the heads of some of North America’s biggest companies on Monday night in an attempt to reassure them on Brexit. “We will be getting the right deal for the United Kingdom and that is the right deal in terms of trade in goods,” May told the investors and chief executives. “The UK is going to be out there. We will be looking for business. And ladies and gentlemen, please feel free to invest in the UK,” she said. Japanese Prime Minister Shinzo Abe told May he wanted May to ensure that Japanese companies in Britain could continue to operate after Brexit, according to a Japanese government spokesman. US President Barack Obama has called for an orderly Brexit while affirming strong ties with London. Republican presidential nominee Donald Trump has said that the Brexit vote was a “great thing” and that Britain would remain a great ally. May, who did not meet either Trump or Democratic nominee Hillary Clinton on her trip, avoided public mention of Britain’s close alliance with the United States in her speech. But she said Britain would strengthen partnerships with NATO, the Commonwealth and the United Nations. She announced Britain would send more military teams to help Somalia fight Al Shabaab militants. A British official said 30 training teams will be deployed with up to 70 troops at a time. May, who argued before she won Britain’s top job that the UN was flawed but necessary, said the 193-member organisation should ensure its relevance by serving the millions of people who feel left behind by globalisation. “We must recognise that for too many of those men and women the increasing pace of globalisation has left them feeling left behind,” May, 59, told the UN.